Android match-3 games come in all shapes and forms, theyu utilize colored orbs, gems, food, candy, emoji and other items to create matches. These Android games offer a fun way to spend a little down time while on the go, they offer you a fun escape while anchored to a desk or stretched out on the couch. We scoured the shelves of the Google Play Store to find one of the best match-3 games for your mobile device. Today we’re sharing with you one of our favorite fruit matching games. The game’s called Fruit Jam. We love it because it is addictive, fun, and presented with beautiful design. The colorful graphics are pleasing for the eye, the music is engaging for the ear, and the controls are intuitive and neat for easy playing. Let’s talk more about its gameplay and why we liked it so much. Fruit Jam is a great game for your mind and matching skills. Its gameplay allows you to have fun and challenge your brain at the same time. 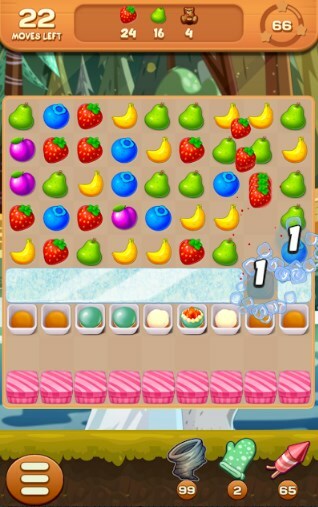 The main goal in this game is to match the tasty fruits, win scores and levels. Just tap on the fruits to swap and match 3 or more of them, watch your moves (they’re limited) and win more points. If you score higher, you will win the level you’re playing. Complete as many quests as possible, win all levels and become the greatest fruit matcher in the world. Moreover, Fruit Jam features cool power-ups and boosters that will help you progress to the more challenging levels. You can compete with your friends and family as well. If you want to download this cool puzzle game, go to the Google Play Store and get it immediately – it’s totally free to play!